Both the softball and baseball teams wrapped up their seasons on Sunday, but the tone with which the seasons ended couldn’t have been more different. The softball team fell 9-3 on Sunday night to Washington, assuring the Huskies of a spot in the championship series against Florida and ending an exhausting run of four games over two days for Georgia. Along the way the Dawgs eliminated Missouri, upset Big 10 champ Michigan, and pushed a strong Washington team to the brink of elimination by lighting up one of the best pitchers in the game. Though the two departing seniors were important pieces of the team, the story you couldn’t avoid over the weekend was that everyone else will be back for at least two more years. Finding a new pitching ace will be critical to the team’s future, but the powerful offense will be more or less intact. All that is no guarantee that the team will be able to go as far or even deeper in the coming years, but you’ve got to like their chances. There’s no question though the Georgia softball is firmly on the national map now, and the underclassmen have a taste of what it will take to win it all. 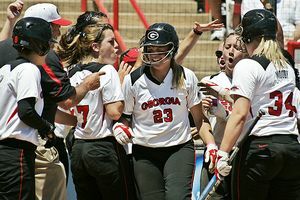 At the very least, Georgia softball won themselves a lot of new fans from the Super Regional comebacks through the WCWS run. I’m one of them. They were entertaining to watch, played loose even under the incredible pressure of the moment, and love playing for Georgia – how can you not like a player who knows the significance of wearing #34 at Georgia? Names like Schnake, Schlopy, Hesson, and Goler were on the radar of even the football-only crowd this weekend, and they’ll have a lot more people tuning in to see how they follow it up next year. The outlook was far less sunny for the baseball team after it fell to Ohio State 13-6 in the elimination game. First was the embarassment of losing to a team that set records for futility its two regional losses. But more troubling was the way in which Georgia lost the game. Three errors. Baserunning blunders. Less-than-acceptable effort from an upperclassman starter. I guess you can credit Ohio State for not collapsing after falling behind 5-0 to a team that routed them on Friday, but the loss is as much on Georgia as it is for the Buckeyes rising to the occasion. Leadership was a frequent scapegoat in the many autopsies of the 2008 football season, and it sounds as if some of the same themes are coming up around the baseball team. Coach Perno has always been frank and direct with his thoughts, but the postgame comments after Sunday’s loss were fascinating in terms of what wasn’t held back. During the team’s 2007 CWS run, the team certainly leaned on veterans Beckham, Peisel, and Fields. When players like Massanari, Lewis, Cerione, Poythress, and Weaver turned it up in the postseason, the result was a solid team built for a deep run. But absent those 2007 stars, the returning veterans couldn’t carry the team down the stretch and into the postseason. Will next year continue the even-year success that Georgia has enjoyed this decade? Certainly there’s a strong core of rising sophomores returning, and there’s another strong recruiting class coming in (subject to the draft of course). But who will be considered the leaders of the team? Poythress is surely going to be drafted. Cerione will be a senior, but can a guy who “just can’t handle his emotions” (according to Perno) be looked to as a leader? After he was pulled from the game and Perno’s postgame comments which accused Cerione of “jump(ing) into the fence just to jump into the fence”, part of me wondered if Cerione had played his last game at Georgia. Joey Lewis looks to be the sole everyday player who you’d feel comfortable about as a senior leader, and he might be drafted too. David Ching has some thoughts and additional information about next year’s roster. Pitching (and especially the bullpen) is a whole other can of worms. McRee’s disappointing season might make him a less-attractive draft pick this year, but can he find the control to go with his pro-quality stuff and emerge as the ace? Can Weaver shake off a woeful end to the season and reestablish himself as the go-to guy in the bullpen? Perno was on 960 The Ref early this morning and said that Poythress, Lewis, Cerione, Weaver, and Earles would be leaving early. Obviously we lose seniors Massanari, Holder, and Harvil as well. Pallazzone & McRee will be back as starters. Praying next year will finally be McRee’s year to prove he’s the phenom we thought he was when we signed him. Honestly, i’m not entirely optimistic. As Ching noted, just with the loss of Mass, Lewis & Poythress we lose 63 homers. That’s enough to stop your heart for a minute. We’ve gotta do something about our pitching. Good God, that was the most glaring problem the entire season. We used to be known around the country as “UGA – University of Good Arms.” Excited to see what the incoming freshman Montgomery will do, but we need 4 or 5 just like him. We do have 4 good left-handers coming in, 10 pitchers total. We’ll see how they measure up against the SEC though. Brady, Eller & Perno have really slacked off w/ recruiting the best pitchers which concerns me greatly quite frankly. Just good will not cut it anymore. One last comment: i really wish Perno would shut his mouth when talking about our kids in the press. Its low rent to call a guy out like that publicly and its not the Georgia way. Perno needs to handle that stuff in-house. Expressing his frustrations about college kids in the press looks like he’s making excuses for bad play and for his coaching failures. He needs to remember, the buck stops with him…literally. Great post as always Groo!